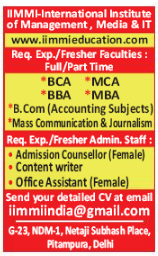 International Institute of Management Media & IT, New Delhi has advertised in THE HINDUSTAN TIMES newspaper for recruitment of Teaching Faculty Plus Non-Faculty jobs vacancies. Interested and eligible job aspirants are requested to apply immediately from 13th November 2018. Check out further more details below. College Profile: International Institute of Management, Media &amp; IT (IIMMI) has emerged as one of the most famous and reputed institutes in the field of education. In the modern era of competitive entrepreneurship in corporate world, we need courses that impart professional education and prepare industry ready students. There has been a significant change in the way businesses are being run and grown. In keeping with the current social scenario and the demands of the industry, we offer a range of courses at both graduate and postgraduate level. How to Apply: Interested and eligible candidates are requested to send updated CV along with copies of certificates and recent passport size photos to the email address or postal address mentioned below.